These cappuccino brownies are perfect for coffee lovers. 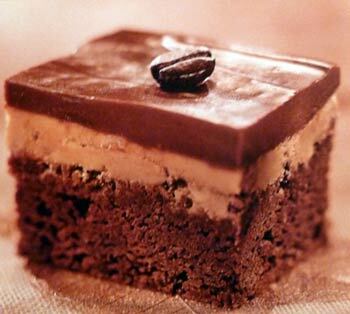 The flavors of coffee and cream are sandwiched between a rich chocolate brownie base and a fudgy chocolate frosting. Decorate each brownie with a roasted coffee bean for an extra special treat! The traditional cappuccino coffe drink mixes steamed milk with espresso and then tops it off with a milk foam. The flavor of these brownies mimics the cappuccino flavor by using instant coffee dissolved in whipping cream - which pairs perfectly with the chocolateness of the brownie batter and frosting. Before serving, you will need to chill these brownies in the pan until the frosting is set. Preheat oven to 350F degrees. Lightly grease an 8x8-inch baking pan and set aside. In a medium saucepan, melt 1/2 cup butter and unsweetened chocolate over low heat, stirring constantly. Add eggs, 1 at a time, beating with a wooden spoon after each addition, just until combined. In a small bowl, stir together flour and baking soda. Gradually add dry flour mixture to chocolate mixture, stirring just until combined. Spread batter evenly into bottom of prepared pan. For the topping, dissolve coffee crystals in whipping cream. In a small mixing bowl with an electric mixer on medium speed, beat together powdered sugar and 2 tablespoons butter. Add whipping cream mixture and beat until creamy. If necessary, add a little more whipping cream until mixture is spreadable. Spread mixture over warm brownies. Chill brownies in pan until topping is set, about 1 hour. Prepare the chocolate frosting: In a small saucepan over low heat, combine 1 cup semisweet chocolate chips and 1/3 cup whipping cream. Stir continuously until chocolate is melted and mixture begins to thicken. Carefully spread chocolate frosting over chilled brownies. Chill again until frosting is set. Top each brownie with a coffee bean. This recipe makes about 16 Chocolate Cappuccino Brownies.